Some say Old Shale and some say Feather and Fan. This beautiful stitch pattern has been called Feather and Fan by many and still is. In fact if you do a search for Feather and Fan online, more than likely you'll find this stitch pattern. But as I was preparing to build this page I started doing a little research as I often do. You see I noticed that there were a couple of names associated with this stitch pattern and I really wanted to know which one to use. Somehow the name Feather and Fan never seemed to fit this pattern. So I just had to check into it a little further. That led me to a very interesting post, Feather and Fan versus Old Shale by Elizabeth Lovick and I wanted to share it with you. 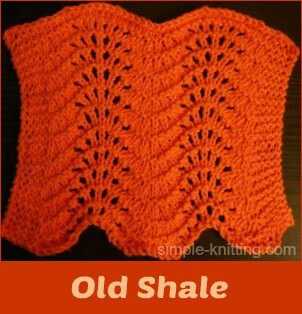 After reading Elizabeth's post I felt it made much more sense to call this pattern Old Shale. It always reminded me of the ocean; waves and pretty sea shells. Even the word Shale sounds like Shells. I bet you think this looks really difficult to knit right? I mean I sure would. But guess what? It really isn't too hard to knit at all. In fact it's one of those stitch patterns that look really difficult when it really isn't. It just has one pattern row, that's it. The other rows are knit and purl. If you are just beginning with lacy knitting this is a perfect lace stitch pattern to work with as well. And if you knit up a baby blanket or a shawl with this lovely stitch, people are going to think you are a knitting superstar. And you will be! Besides making blankets and shawls you can also use this pattern for scarves, fingerless mittens, hats and even skirts and dresses. Just look at the beautiful border that it creates all on its own. These 4 rows complete the pattern. Enjoy this pretty stitch pattern!